Netflix’s next big show to premiere is the BBC adaptation, Troy: Fall of a City, which launches this Friday, April 6. One face you’ll be seeing a lot in the series is star Bella Dayne who plays Helen of Troy, the most beautiful woman in the world. TV Insider spoke with the German actress about that all-important role, and the dramatic moments it has to offer. 'Lost In Space,' Letterman, Joel McHale and more are new this month. Dayne also dished about another upcoming guest role: Talitha Getty in FX’s Trust. So how does she handle the pressures of playing real people? And what can we expect next? Read on to find out! You star as Helen of Troy in Troy: Fall of a City. Was it intimidating to take on the role of the most beautiful and powerful woman in Ancient Greece? Bella Dayne: Definitely. During the process of auditioning multiple times for this part—even the first time I actually auditioned for her—I thought, ‘Oh God, no.’ I’m already panicking about the pressure of fulfilling that. The reason she was described as the most beautiful woman is that she was a warm, open-hearted person and she was sexually confident. And as a woman at the time, that was something that felt dangerous to men. In drawings and descriptions, she’s never really painted because she was supposed to be a fantasy in your mind. But what was described was her character, and what made men be drawn to her was her being confident in herself. Being confident in yourself and self-loving in a way and open-hearted at the same time, that is an aura. That is true beauty. The story of Troy has been told a number of times. What do you think makes this series different? What makes this stand out is you go really into detail with the story. What is so beautifully shown in the series is how much the gods played a role at the time for the Greeks and how much they influenced their lives—how it was just a given that they believed in these gods. 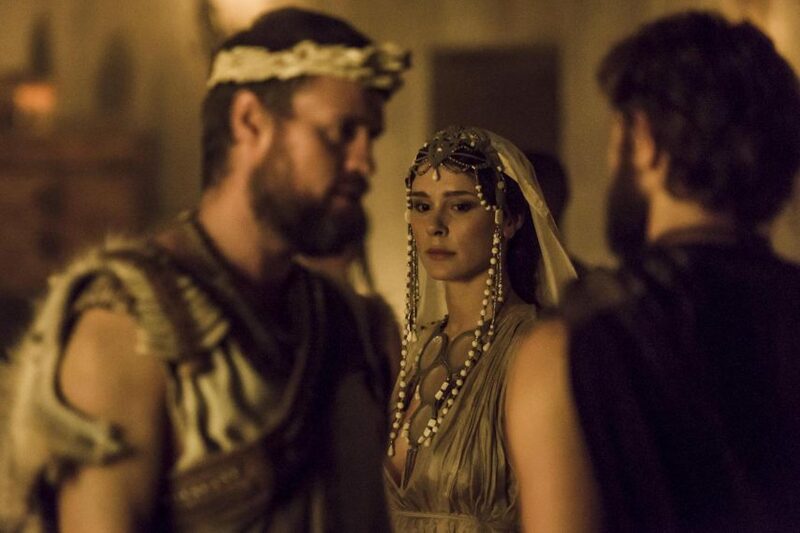 At the same time, what I think is fantastic is that with each of the characters on both the Trojan side and the Greek side you go into [their] psychology. So you actually see and understand where the behaviors come from and what pain it derives from. It makes them human, which as an audience it’s really interesting and captivating. You don’t really know what side you’re rooting for because you understand all these different perspectives. What did you want to bring to your role as Helen to differentiate from how other actresses like Diane Kruger have done it before? I realized that a lot of how she had been portrayed in literature years after The Iliad was written was from a one-sided perspective and was from a scared male perspective. I actually want an understanding of how she grew up and how jailed she was and how her life was up until she met Paris. I understood that this was a woman that had not lived yet, in any way, and that being in an emotionally-abusive relationship is something that, at the time, women would’ve never even thought of getting out of. Her doing that was so modern for her time, and that must’ve taken so much courage. So I think this is telling the story of a woman finding her voice and truly finding her self-respect and self-love. Another project you have in the works is FX’s Trust. Your character, Talitha, will be seen in the seventh episode this season. What can you tell us about her role in the story? What is important with her is what she caused for [husband John Paul Getty Jr.], for his life. She introduced him to a whole different world, to the art scene and hanging out with rock stars. And just made him question the life that he was trying to pursue beforehand pleasing his father. She’s a liberal, free spirit and confident in her sexuality. That’s why, at the time, they became such an ‘it’ couple. He kind of opened up to being a hippie with her and living that life to the fullest. Michael Esper as John Paul Getty Jr.
Talitha was obviously a real person. What’s it like taking on a non-fiction role, as opposed to other fictional characters you’ve played? It definitely is different to play someone who is real because you feel the responsibility of being as accurate as possible. Obviously you do as much research as possible, and you try to, most of all, capture the essence of that person. At the same time, it’s so fun—especially when you have makeup and costumes—to morph into the look of that person. So that’s really magical. Talitha is the stepmother of John Paul Getty III, whose kidnapping spurs the events of the show. How would you describe her relationship with him? I think that Paul [John Paul Getty Jr.] maybe neglected sometimes the parenting part. I don’t think, at the time, people thought about how that would affect a child—to be around people [who are] walking around naked and doing drugs. Even though she loved his son, I think the kind of responsibility that comes with being a mother and setting an example for the child didn’t exactly come along with that lifestyle. The new FX series features stars Donald Sutherland, Hilary Swank, and more. As of right now, Talitha is only set to appear in one episode. Can fans expect to see more about her in the future? Could you see the show continuing for a second season? I mean it’s possible. It depends on if they go back, if they have flashbacks, or dive into certain parts of the story more in detail.